Named by Garden & Gun as one of the best books of 2018, For the Love of the South captures the essence of Southern culture—a deep devotion to family, friends, and food—in a charming cookbook featuring delicious, comforting recipes, her recollections of growing up on the bayous of Louisiana, and more than 100 full-color and black-and-white photographs. Amber Wilson’s popular blog, For the Love of the South, reflects the generosity, cordiality, and sense of tradition that are the heart of Southern culture. In her engaging posts, she shares personal, entertaining stories about her childhood in the deep South, pays tribute to her heritage, and presents mouthwatering recipes that showcase the best of the region’s cooking, accompanied by gorgeous photos. In this first book, drawn from her popular website, she brings together 100 delectable, accessible, and easy-to-make recipes for Southern classics, and mixes them with delightful family anecdotes, which convey her love and respect for her roots. A terrific cook and captivating writer, Amber is also an accomplished photographer. For the Love of the South showcases 100 of her pictures—both black-and-white and color images of ingredient prep and finished dishes, as well as photos that evoke quintessential Southern life. No matter where in the country you live, no matter if you’ve barely used a stove or are an old hand around the kitchen, Amber teaches you how to master a host of Southern dishes, from starters to desserts. The recipes use inexpensive, readily available ingredients and come with instructive, encouraging directions. Learn to make a roux, perfect the popover, fry okra, lattice a piecrust, and create irresistible gumbos and jambalayas like a true Southerner. From Pain Perdu, Pimento Hushpuppies, Corn Bisque, and Spicy Oven-Roasted Okra to Tomato and Bacon Sandwich with Chipotle Mayonnaise, Nashville Hot Chicken, Cajun Jambalaya, and Bacon-Latticed Apple Pie, there’s something tasty for everyone. Amber offers a pantry-full of time- and money-saving kitchen tips—from storing and freezing bacon to prolonging fresh berries in the fridge, seasoning cast-iron skillets, and making vanilla extract—and provides helpful do-ahead and leftover-saving tips for many recipes as well. Grab a chair, sit down for a spell, and enjoy a taste of Southern life and food with For the Love of the South. Amber Wilson is a self-taught home cook with an insatiable desire to honor the culinary culture of the South as well as to create new dishes. Once on a career path in science and offered a job at NASA, she decided to change course and start her blog, For the Love of the South. An homage to her Southern roots, the blog was a finalist in Saveur’s Best Food Blog Awards and was one of PBS’s Best Food Blogs. Wilson was one of Southern Living’s “30 Bloggers You Should Be Following.” She lives in Nashville, Tennessee, with her husband, Michael. Wilson’s book is as practical as it is pretty. There’s no question that we have gleaned useful material from this book beyond new recipes. The beauty of Wilson’s dishes is that, no matter where in the country you live or how much of a novice you are in the kitchen, she teaches you how to master many Southern dishes, from starters to desserts. The recipes feature readily available ingredients and come with instructive directions. Drawing from her blog For the Love of the South, self-taught cook Amber Wilson, whose Instagram account has 168,000 followers, offers recipes for recognizably Southern dishes— pimento hush puppies, oven-roasted okra, bacon-latticed apple pie—alongside family anecdotes. The brand new cookbook, full of mouthwatering Southern recipes and photos (taken by Amber herself), is one you’ll definitely get mileage out of in the kitchen. 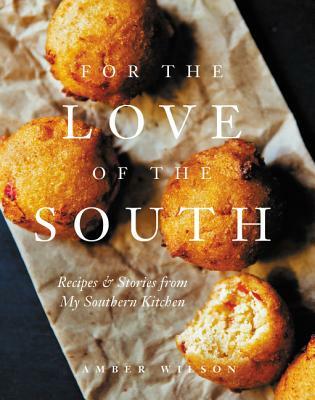 For the Love of the South: Recipes and Stories from My Southern Kitchen by the Nashville-based blogger Amber Wilson is a beautifully photographed love song to updated Southern classics like ambrosia salad and lady peas. No matter where in the country you live, no matter if you’ve barely used a stove or are an old hand around the kitchen, Amber teaches you how to master a host of Southern dishes, from starters to desserts. If you’re not sure what Southern hospitality entails, just leaf through Amber Wilson’s For the Love of the South. The creator of the eponymous blog wanted readers to feel like she’s in the kitchen with you, rolling out dough and stirring roux, and the familial warmth splashes off the page. No matter where in the country you live, no matter if you’ve barely used a stove or are an old hand around the kitchen, Wilson teaches you how to master a host of Southern dishes, from starters to desserts. This collection of recipes captures the essence of Southern culture and honors family, friends, and food. Amber Wilson beautifully evokes the joys and comforts of Southern food and life with this personal, accessible cookbook.